I recently had the pleasure of doing a makeup application for Tracey Medeiros. She is the author of several cookbooks, most notably “The Connecticut Farm Table Cookbook”, “The Vermont Farm Table Cookbook”, “Dishing Up Vermont”, and her newest cookbook; “The Vermont Non-GMO Cookbook”. 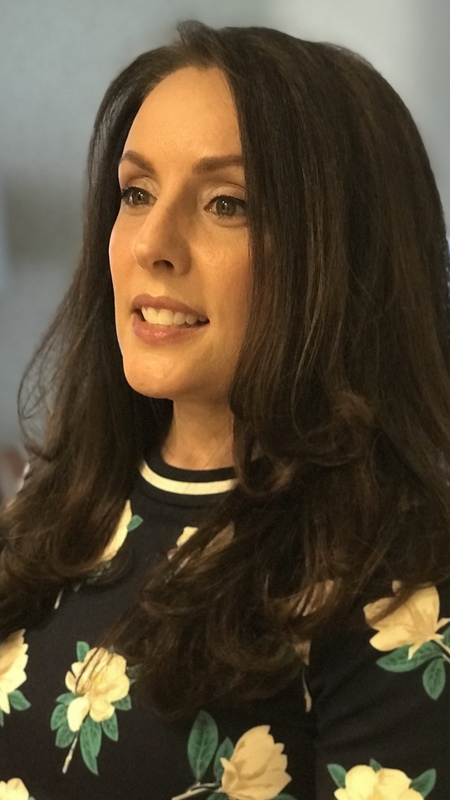 Tracey was nominated for the 2018 Readable Feast Cookbook Award for her “The Vermont Non-GMO Cookbook”, and dropped by the Katrina Hess Makeup Studio to have a makeover. I was thrilled to have this opportunity to meet her and to learn about the cookbooks she has written. A beautiful look on a beautiful lady, she looks like a winner to me! 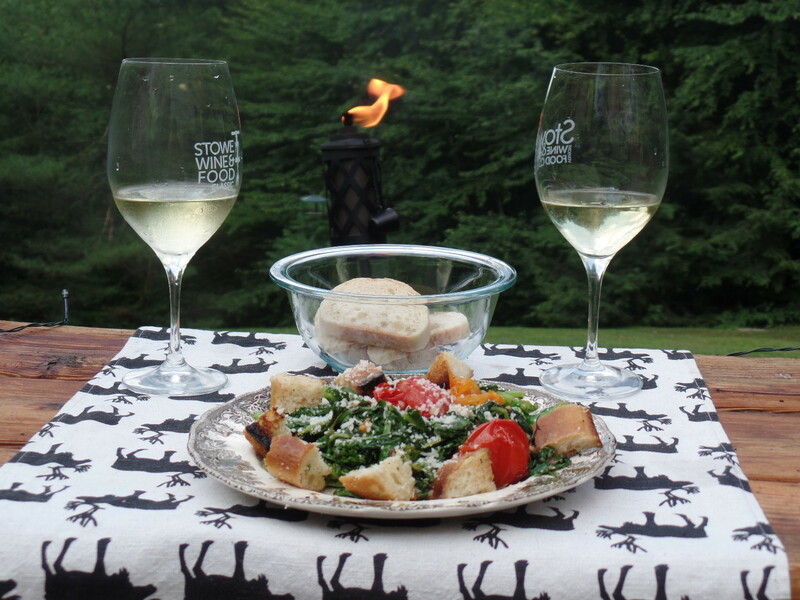 A favorite recipe of Tracey’s, one from “The Vermont Non-GMO Cookbook” is the Grilled Bread Salad with Broccoli Rabe, Cherry Tomatoes, and Parmigiano-Reggiano Cheese. With the onset of hot weather, this is the perfect summer salad that won’t heat up your kitchen! 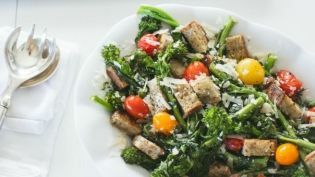 This easy-to-prepare salad has lots of flavors, from the slightly bitter tasting broccoli rabe to the mildly sweet tomatoes, as well as bright citrus notes from the lemon juice. The assortment of colored tomatoes makes a striking contrast with the green broccoli rabe. Presoak bamboo skewers for 30 minutes or have ready metal skewers. Slide the tomatoes on skewers. Set aside. Heat a gas or electric grill to medium heat and generously brush the cooking grate with oil. Place the broccoli rabe in a colander and wash well under cold running water. Run a knife down the center of any thick stalks, more than 1/2-inch thick, leaving the stems intact at the top. Drizzle with olive oil and season with salt and pepper to taste. Set aside. Brush the lemons with 1/2 tablespoon olive oil and season with salt and pepper to taste. Place the sugar on a small plate and dip each of the lemon halves cut side down, into the sugar. Grill the lemons cut side down until golden brown at the edges, about 5 minutes. Using tongs, carefully flip the lemons over and grill for 2 more minutes. Remove from the grill and set aside. When cool enough to handle squeeze the lemon juice into a small bowl. Generously brush both sides of the bread slices with olive oil and season with salt and pepper to taste. Grill the bread, flipping once until crisp and golden brown, about 4 minutes per side. Transfer to a plate and allow to cool. Meanwhile, arrange the broccoli rabe in a single layer across the grill grate. Grill, turning often, for about 4 minutes. Transfer to a large bowl. Brush the tomatoes with 1/2 tablespoon of olive oil and season with salt and pepper to taste. Arrange the tomato skewers evenly across the grill grate. Grill until nicely blistered in spots, about 5 minutes. When cool enough to handle, carefully remove the tomatoes from the skewers into the bowl with the broccoli rabe. Cut bread slices into 1/2-inch cubes and add to the bowl with the vegetables. Add the basil, garlic, and 3 tablespoons of lemon juice tossing until well combined. Arrange on a decorative platter. Drizzle with additional olive oil and lemon juice, if desired. Top with cheese. Adjust seasonings with salt and pepper to taste. Serve at room temperature. Recipe from The Vermont Non-GMO Cookbook by Tracey Medeiros (Skyhorse Publishing, October 2017). We made this recipe on Sunday. It turned out well. We found it works better if you have two people to make it. One for the preparation, and one for the grilling. This is a wonderful adaptable salad. You could add any grilled protein to make it a complete meal. We used garlic infused olive oil on the bread. The sugar on the lemons prior to grilling was my favorite touch. Enjoy this with a crisp white wine such as a Vino Verde or Albarino.